Good morning! 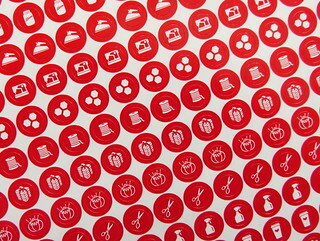 I'm very excited to show you the box of Scrappy Project Goodness I received from Fat Quarter Shop. 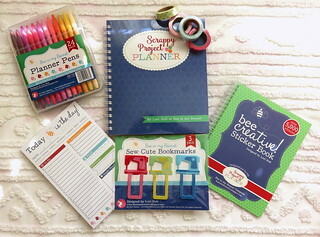 The box was packed to the brim (in adorable packaging I might add) with Lori Holt's new Scrappy Project Planner and all the accessories that go with it. I can't get over how cute it all is. And what I really like it that it all goes so well with the cute tins. You'll be completely accessorized. I don't know what to talk about first, the pens to color in your quilt layouts? There's plenty of spots where you will be using them to design blocks or quilts or make quick sketches in the project planner. 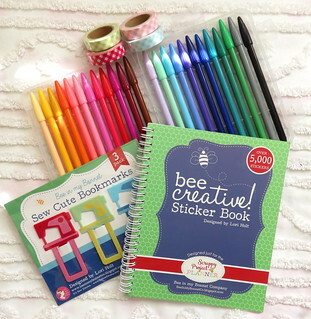 You can tape your fabric swatches in there with the washi tape and mark the page with the sewing machine book mark. 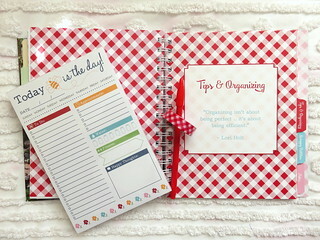 Other sections of the planner include Tips and Organizing... I can tell you that's going to require some study time, better mark the day in my planner! Lori includes not only a description of her method of scrap management, but a list of all her shortcut methods, including handy charts showing you cutting size charts. Then it's time for the Scrappy Patterns. There's 6 cute patterns, my favorites being the Scrappy-Apple Quilt and the Patchwork Tulip Quilt. It's cozy time and that's the perfect time to get started on something new, right? I love my planner and all the wonderful things that came with it. It's the perfect spot to record your projects and your coffee dates and check for cutting sizes and find some pretty quilts to make. Thanks Fat Quarter Shop for sending me all the tools that I need to make my life more cute and more organized! If you'd like to see more pictures of the quilts and the goodies check the instagram hashtag #scrappyprojectplanner! There are lots of pretty photos of everything there! Hmmmm...I have been closing my eyes to these but I am starting to waffle! Gorgeous! So inspiring and colourful!